Rep. Cathy McMorris Rodgers, the highest-ranking female Republican in the House of Representatives, took to Twitter on Sunday to offer a fiery rebuke of the Washington Post and its deputy editorial page editor, Ruth Marcus, after she defended aborting children with Down syndrome. McMorris Rodgers, herself a mother of a child diagnosed with Down syndrome, took exception to an op-ed Marcus penned Friday defending the right of women to abort children diagnosed with genetic disorders. "I would’ve aborted a fetus with Down syndome. Women need that right," Marcus wrote. Marcus, who has a long history of supporting liberal causes and whose husband served in the Obama administration, wrote the piece in response to legislation passed by states like Ohio, Lousiana, and North Dakota to ban the practice of aborting fetuses who have been determined, through prenatal testing, to have Down syndrome or other genetic abnormalities. In her op-ed, Marcus argued that not only was it "unconstitutional" for state governments to ban abortion after a diagnosis of Down syndrome, but that such attempts were also "unenforceable" and "wrong." Marcus said that while she admired families who chose to bring children with Down syndrome into the world, her stance is influenced by the life-altering impact such an individual has on the entire family, noting the "limited capacity for independent living and financial security" individuals with Down syndrome face. "But accepting that essential truth is different from compelling a woman to give birth to a child whose intellectual capacity will be impaired, whose life choices will be limited, whose health may be compromised. Most children with Down syndrome have mild to moderate cognitive impairment," she wrote. "This means limited capacity for independent living and financial security; Down syndrome is life-altering for the entire family." Marcus, herself a mother of two, had no qualms about admitting that if one of her children had been diagnosed with Down syndrome, she would have chosen to have an abortion. "I can say without hesitation that, tragic as it would have felt and ghastly as a second-trimester abortion would have been, I would have terminated those pregnancies had the testing come back positive," Marcus wrote. "I’m going to be blunt here: That was not the child I wanted." Citing a study showing that 67 percent of women chose to have an abortion after receiving a Down syndrome diagnosis, Marcus claimed her decision was not abnormal and that she was "in good company." McMorris Rodgers took offense to Marcus' assertion that children with Down syndrome had less to offer and were automatically relegated to a lower quality of life. The congresswoman elaborated on the struggles her own family has faced in caring for a child with Down syndrome and on the ingenuity her son has shown in not being defined by a slight genetic alteration. But earlier this year, I challenged others to find ways to reach out to those who are not yet friends of the pro-life community by sharing their stories. So, this is my story cc: @RuthMarcus. I know how difficult it is to be told that your child’s life is going to be different than you dreamed. There are countless people with Down syndrome who, like Cole, are changing the world. 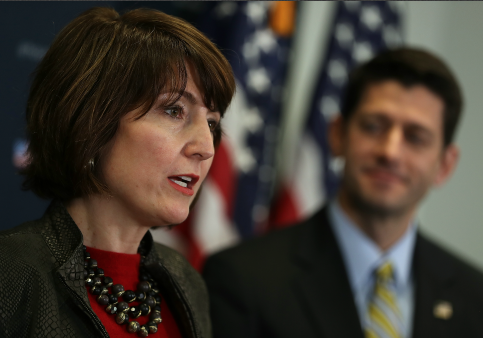 McMorris Rodgers also urged individuals with Down syndrome to share their stories with the world and push back on the assertion that their lives are somehow less worth living. This entry was posted in Issues and tagged Abortion, Cathy McMorris Rodgers, House of Representatives, The Washington Post, Washington. Bookmark the permalink.